"In recognition of his kind and generous spirit and stanch Christian character throughout the years, this little book is dedicated to Brother George by the Author." The writing of a history of the Hoffsommer family was suggested to me several years ago by some members of the fifth generation as used here. My first thoughts were to write a story merely of the immediate family and a short mention of a few of the European ancestors, but I have carried the genealogy into the seventh generation beginning with my father's grandfather. This task was begun several years ago, and my intentions were to complete it not later than the fall of 1949. In this I was prevented because of sickness. Thanks to the many who have co-operated in gathering the necessary information. It is hoped that the number of mistakes are few and will be pardoned. I am offering this history as a means of making a better acquaintance among the members of the relationship scattered from New York City to California. The appended list of names and addresses may be useful. In the earlier part of the story North Western College is the name used for the same institution that later was named North Central College. It will also be noted that the name Evangelical Association and Evangelical Church are used interchangeably, meaning the same organization. In 1946, the Evangelical and the United Brethren Churches were united, thus constituting the Evangelical United Brethern Church. The names in the history are numbered consecutively and are grouped in families. The first number following the name indicates the generation to which that person belongs; and the second, the number of the parent. Because it seemed more natural and convenient for me; and it may appear quite obvious to the reader, I have taken the privilege of writing in the first person in that part of the history that comes under father's name, John Hoffsommer, of the third generation. The first authentic mention in history of the German people was by Julius Ceasar in his "Commentaries". In designating them he used the term Germani, but they called themselves Deutsch. This term is not to be confounded with the name Dutch, which designates the people and language of Holland. The Germans did not constitute an organized nation but were divided into small states. As time passed, many of these united. By 1806, those along the Rhine River formed what was called the "Confederation of the Rhine". Prussia and Austria were rivals for leadership in the east German states. In a short war between them in 1866, Austria was excluded. In 1870, the "Confederation of the Rhine" joined the eastern German states under the leadership of Prussia in a war against France. France was defeated, and the King of Prussia, William I, retained his position as King of Prussia and was crowned Emperor of the German Empire in 1871. His grandson, William II, often spoken of as the Kaiser, was proud and haughty and was greatly responsible for World War I. Soon after the close of this war, Hitler came upon the scene and in time brought on World War II, and downfall of the German Empire resulted. For many years Germany was noted for her leaders in literature, music, science, religion and education; and what might she have been, had she followed the teachings and leadings of such persons instead of following the teachings of vain philosophers, atheistic leaders and misguided jealous politicians? It still is true that "Righteousness exalteth a nation: but sin is a reproach to any people." By noticing a few dates given above, it will be seen that when John Hoffsommer came to the United States, The German Empire had not yet been formed. ...was born in Mitterode, Kreis Eschwege, Hessen Cassel, Germany, date not known. He was married to Anna Martha Bornshuer. He died at the ate of 59, and his wife attained the ripe old age of 98. They were tillers of the soil. The number of children they had is not known. ...son of John and Anna M. Bornshuer Hoffsommer, was born May 30, 1805, in the same place as was his father. His occupation was that of linen weaver and day laborer. He was married to Anna Elizabeth Bommhart, who was born August 10, 1802. She died in 1854, and is buried in Germany. He came to the United States in 1857, with five of his children, John, Anna Elizabeth, John Adam, Adam and Catharine. 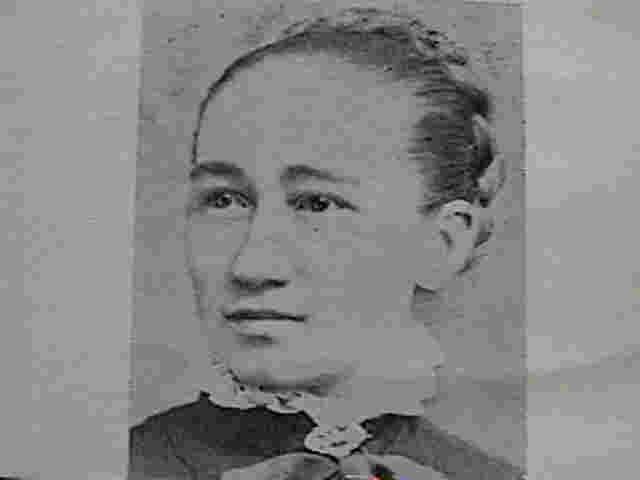 An older daughter, Anna Catharine Dietrich, a widow, with her four sons, Jacob, Henry, William and Adam, came to this country in 1866. One of her sons died on the voyage and was buried at sea. With Mrs. Dietrich also came Mary Horchler, a niece of Mother John Hoffsommer. He was a member of the Lutheran Church. He passed away December 21, 1878, at the age of 73 years, six months and 21 days and is buried in the cemetery in Hazleton, Pennsylvania. As was customary among some people in those days when a member of the family died the clock was stopped at the time of death, and also the pictures hanging on the walls were turned. Both of the customs were observed at the time of his death. ...son of George and Anna E Bommhart Hoffsommer, was born March 16, 1829, in Mitterode, Kreis Eschwege, Hessen Cassel, Germany. As a boy he took advantage of the school privileges offered at that time to the youth of his native land. In his early life, he was a linen weaver and day laborer. On January 15, 1850, he was ordered into the army, namely, the mounted artillery. His time of service was five years, of which time, however, he was in active service but two years and nine months. He received an honorable discharge. Not much data is available on the maternal side of the family. Mother's maiden name was Maria Herrmann, daughter of Nicalaus and Catharina Shenk Herrmann. She was born in Stadhosback, Kreis Eschwege, Hessen Cassel on December 7, 1826. It was early in November 1856, that father and mother and their first born child, Conrad, left their native land to seek their fortunes in the United States, the land of freedom and opportunity. They embarked on a sailing vessel at a German port, and, as they sailed on, they were privileged to see the Dover Cliffs on the southeast shore of England. After a stormy voyage of 61 days, they landed at Castle Garden, New York City, January 3, 1857. During the greater part of the voyage, mother was seasick. They went at once to Hazleton, Pennsylvania, where they made their home for over 22 years. During these years, father worked in the anthracite coal mines over ten years, was employed in a lumber yard some time and was engaged in the butcher business about 12 years. It was during these years that the other members of the family were born: Conrad (born in Germany), Katharine, Adam, Anna Elizabeth, Mary, John Adam, William Herrmann, John George, Jacob Charles and Ida Savilla. 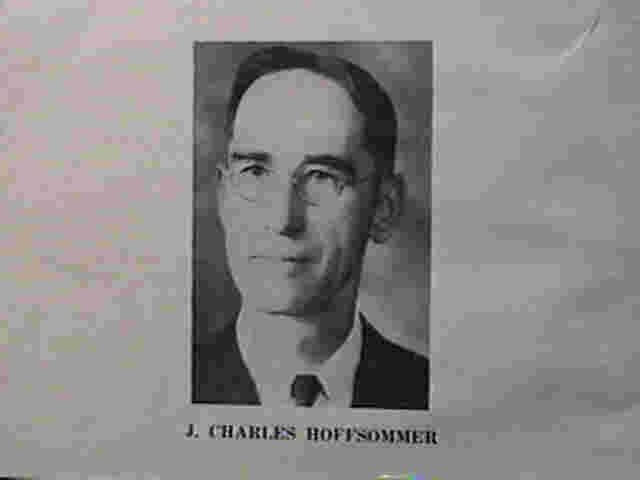 It might be interesting here to note that the family name is spelled Hofsommer in father's army discharge, which he received several years before leaving Germany. When the second "f" was first used in the spelling of the name and why, is not known. In his naturalization paper, which was issued at Wilkes-Barre, Pennsylvania, August 28, 1865, the name is spelled with the second "f". I have in my possession both of these papers just named. The name, Hoffsommer, divided into its component parts, Hof and Sommer, and translated into English, would indicate that it means summer court, or yard, as Hof is the German for court, or yard, and Sommer, the word for summer. By referring to the time when our parents came to America, it will be observed that the Civil War soon came on. Father had in mind to volunteer his services for his adopted country and had even left home and had gone to some place in New Jersey to enlist, thinking rather to do so than be drafted. As there had been several drafts, and the quota from Hazleton had been filled, no more were accepted at that time. Accordingly, he did not see service in the army during the war between the North and the South. For a number of years the butcher business in which father was engaged was very prosperous. The house in which the family had been living was not large enough, so it was decided to build a brick house. This house was a three story structure and had 19 rooms in it. About one-half o it was leased to tenants. It was modern and was lighted by gas as the electric light had not yet been perfected by Edison. Some of the furnishings were purchased in Philadelphia. Ida was the only member of the family born in this house. To the rear of the house, a bake oven was built. In this oven mother baked the bread, both wheat and rye, coffee cakes and pies for the family. She would first heat the oven by burning wood in it. After the wood had been consumed, she would rake the ashes to the sides and then place the things to be baked in the oven. The Panic of 1873 made serious inroads into father's business and financial affairs. So much of the retail butcher business among the laboring classes was on a credit basis, and, when the miners and other laboring people were unemployed much of the time as a result of the Panic, they did not pay their meat bills. Aside from these losses of thousands of dollars, father had been too free and liberal in going security for other people, so in this way he also lost much money. As previously mentioned, Mary Horchler, mother's niece came from Germany in 1866. As far as is known, she was the only relative of mother's that came to this country. For five years she worked in the Hoffsommer home, following which she was married to George Fey. He died about 1894, and some years later she married Rev. John Lange, a local preacher in the German Methodist Church, at Halstead, Kansas. She passed away in Wichita, Kansas, September 15, 1938, and is buried at Halstead, Kansas. Some friends of the family from Hazleton had moved to Kansas. This, no doubt, had something to do with reference to father's making a trip to see the country and to learn something of its possibilities. This trip was probably made early in 1878, for it was in that year that Conrad moved to Kansas. On March 4, 1879, father, mother, John, William, George, Ida and I left Hazleton for the far West. In preparation for this long move, father had chartered a freight car to transport our belongings to what was to become the new home in Kansas. In this car were placed the household goods, consisting of furniture, including a Mason and Hamlin parlor organ, cooking utensils, dishes, wall pictures and clothing; some hemlock lumber, a large iron kettle, a two-seated canopy-top wide tread buggy, fine silver plated set of buggy harness, blacksmith-made hoes, shoe mending outfit, consisting of leather, sole leather, wooden shoe pegs, wooden shoe lasts, was, shoe-maker's thread, bristles, needles and ink for polishing sole edges and such other things that might be needed on a farm some distance from a town in the far West. As we were speeding along east of St. Louis, Missouri, our train and a freight train collided. The front wheels of the coach in which we were riding, were derailed by the impact. The locomotives were badly wrecked, and two men, one an engineer and the other a fireman, were killed. This happened at night, and I well remember the jolt we received and also of seeing a white sheet, which had been spread over the bodies of the men that had lost their lives. Soon after the accident, we were taken to a St. Louis hotel, where we remained until we could resume our journey. We arrived at Salina, Kansas, about 2 a.m., March 8. Mother and two or three of us younger children were taken to a hotel for the remainder of the night, and the other members of the family stayed at a livery stable until morning. Mother said later that she wished that she also had gone to the livery stable because of the annoyance caused by the bed bugs at the hotel. Brother Conrad and a friend or two were at Salina to meet us and to take us to his home, which was something like 30 miles distant to the south and east. In her journal for March 9, Melinda, Conrad's wife says: "Today we had family prayer meeting and for April 6, "We had a family prayer meeting at my father-in-law's, the first one held in their new Kansas home". As a wagon load of household goods and other things were being hauled from Salina to the new home, the team became somewhat frightened as father was driving along near a creek not far from the new home. One of the horses crowded against the other, and as a result, the wagon was overturned and its contents were dumped into the stream. Sometime later during the summer, father and several persons, I being one of the number, went to see what might be found of the things that had been overturned into the water. As one man was in the water with a pitchfork trying to find what he could, and especially a large iron kettle, he found a crow bar only. About this time a man of the neighborhood came upon the scene, and, when he learned our mission, said that he had been in swimming in the place, and that he had found an iron kettle. We soon were in possession of the kettle, which was in use for years on the farm, especially when water was being heated at hog-butchering time. The land bought for a home, a quarter section, had very few improvements on it. There was a stone house, a dugout, a broomcorn shed, and possibly a straw stable. For a short time while things were being made ready on the farm, we had our headquarters at brother Conrad's home, which was about a mile and a half from our improvements, by the angling roads. The deed bears the date, March 12, 1879, and was in mother's name. The price paid was $1150.00. The deed was filed for record April 11, 1879. The patent from the government had not yet been issued. It is dated May 15, 1880, and bears the name of President Rutherford B. Hayes. A bill of sale having the same date as that of the deed to the land, shows that father bought the following things: one-half interest in a Marsh harvester, one-half interest in a Weir cultivator, one John Deere 12-inch stirring plow, one Bain wagon, two shoats, 60 head of poultry, one cow, one broom-corn rack, one broom-corn scraper, feed and hay on the place. The price paid was $175.00. When the farm was bought, there were 30 acres in wheat. It was cut with a Marsh harvester and bound by hand. That spring 12 acres were planted to broom-corn. A neighbor used his grain drill for this. He took off all but two of the drills and boxed the large box accordingly. The chinch bugs destroyed about six acres, and the remainder made about a ton and a half, which was sold on the market for $60.00 per ton. A ten-acre afield of oats did not do so well. The corn, about 30 acres, made about 30 bushels to the acre. Church privileges in the community in those early days were not so good. The first time that we went to attend preaching services was to a school house called Good Hope but nicknamed "Hardscrabble." This was about six and one-half miles from home. The minister did not come for some unknown reason to us so we were badly disappointed. Soon after we were settled in our now home a young Evangelical minister from Canada, Kansas, came to see us. This was on May 12, 1879, and on the night of the 14th he preached in our stone "shanty". The sermon was in German, and the text was I Cor. 1:23. From time to time he came and preached. This young minister was none other than Rev. C.F. Erffmeyer, who was in the second year of his ministry. Besides the preaching we had occasionally by Evangelical ministers, there were also ministers of the United Bretheren Church that held services at our school house. Union Sunday schools were organized. In those early times not many of them continued during the winter months. Those that did were called Evergreen Sunday schools. As late as 1884, the American Sunday School Union sent missionaries to Kansas. One of these was in our community and for a while stayed at our home. For a number of years we attended a union Sunday school at the Pleasant Hill school house three and one-half miles from home. Preaching services were also conducted there, following Sunday school, by Methodist ministers from Canton. These services were held in the afternoon. Our school house was about three-quarters of a mile from home. The first building that occupied its site had been moved from another place. This was about the year 1874 or 1875. There had been considerable dissatisfaction on the part of patrons in the south part of the district with reference to the location of the school building. Accordingly, one bright moonlight night a number of men from the south part of the school district, after having previously perfected plans for moving the school house, proceeded with oxen and necessary equipment to move it from its original site. In order to get it to the new location, a creek had to be crossed. It was there that they met their greatest difficulty -- they were stuck -- and daylight caught them. With the benefit of suggestions from a man from McPherson, accustomed to moving houses, they finally succeeded in getting the building out of the creek bed; but about this time a man on whose land the house had previously stood, and whose daughter was the teacher in the district at that time, appeared on the scene. He was very much vexed, but the south faction had gained its point and succeeded in getting the coveted school house to the location desired. Because of this nocturnal migration, it was nicknamed "The Moonlight Traveler". The community was also sometimes called "Fiddlersville" because of a number of early-day "fiddlers" in the neighborhood. About the time we arrived in the community in March 1879, a new frame building much larger than the original one was being constructed. In this house John, William, George, Ida and I attended school. On a bright frosty morning in February 1883,the roof of the new school house caught fire from an overheated flue; and in a short time there was no school house for the boys and girls of the Enterprise community. All desks, which were "home-made" of ordinary soft pine lumber, and school books had been removed from the burning building before the roof and walls collapsed. The remaining part of the school term was held in the farm home of a very public spirited bachelor of the neighborhood. This same man and Siver Johnson, whose daughter, Ida, became brother George's wife in later years, were among the men that piloted "The Moonlight Traveler" to a more nearly central location in the district. It was during the summer of 1879 that plans were made for the building of a house that was sorely needed. Lumber and other materials were hauled from Lindsborg about 15 miles distant. It was on a summer day that father had gone to Lindsborg to get lumber for the new house. Before he reached home, night had overtaken him. In those early days, roads in many places did not follow section lines, but often angling trails extended across the prairies. He was on one of those trails, probably less than a mile from home, when his team of horses got off the trail because one of the horses was faster than the other, and they seemed to travel in more or less of a circle. As it was night and there were no land marks to go by, he lost his sense of direction. Finally, he saw a light in the distance. He headed toward it and soon reached the home of a neighbor about a mile and a half northwest of home. This neighbor graciously brought him home. The new house of six rooms was completed that fall. In her journal for date of November 24, 1879, Melinda states that we had prayer meeting in our new home that day. It might be interesting to note that the house was built of soft pine, and the nails used were cut nails, the kind that carpenters used at that time. William Wohlfarth, a brother of Melinda, did the plastering. The walls did not have a fine hard white finish, but they were kept whitewashed during those earlier years. As has been noted in a previous paragraph, our new Kansas home was about 30 miles distant from Salina, at first our nearest railroad town. During the year 1879, the Atchison, Topeka and Santa Fe Railroad System built its line from the east into McPherson, which is 21 miles from the home. This line was opened for service September 29, 1879. Our nearest town on this branch line was Canton, about 11 miles. The Missouri Pacific Railroad also extended its line from Salina to McPherson during the same year. This provided Lindsborg, about 15 miles from home, with railroad facilities. The well, which furnished water for household and other purposes, was about eight to ten rods from the house. From the well to the house was an incline. Now imagine one of us youngsters going to the water bucket for water to wash hands and face before dinner or supper and finding it empty. Imagine also that the water from the well had to be drawn up with a rope running over an iron pulley attached to an old-fashioned well curb. Often water for laundry purposes was hauled from a nearby little creek. This was softer than well water. Later a cistern was provided at the house. 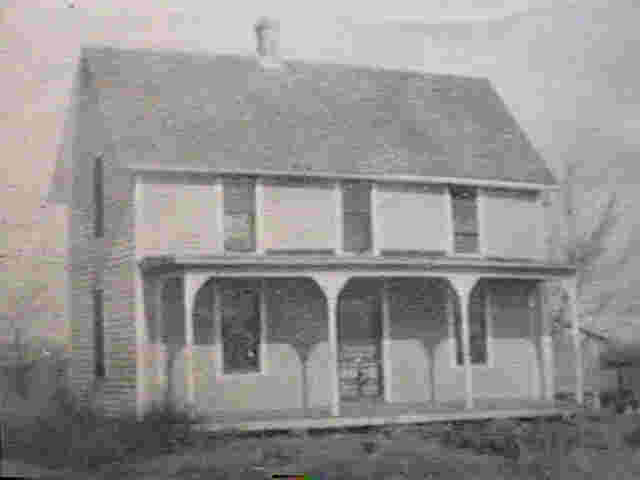 This was after an addition had been made to the house as built in 1879. Because of existing conditions, it was necessary to use "cow chips", corn stalks and corn cobs part of the time for fuel in those very early days. The post office, Battle Hill, was just across the road east of our home, and mail service was twice a week. Some time later, the office was moved about three-quarters of a mile north. In course of time, mail was brought three times a week and carried mostly on horseback. The Battle Hill post office was discontinued during the summer of 1894, and Roxbury, about four and one-half miles distant, was then our post office. Rural free mail delivery was first established in 1897, and our community probably had this service by 1898, the year of the Spanish-American War. At this time John was a subscriber to a daily, The Kansas City Journal. During the autumn of 1887, Rev. M. Manshardt, an Evangelical minister, began meetings in our school house. He, however, preached in the German language, and that was not understood by many people in the community. His son, George, who was preparing for the ministry, soon came and conducted services in English. The people came to hear the young man, and great interest was manifested in the meetings, which resulted in the conversion of a large number of people in the Enterprise neighborhood. House to house prayer meetings were held, and the revival services continued for about six weeks. From this time on the Evangelical church was preaching regularly every two weeks. The Sunday school work also became organized. Our home often entertained the ministers that came into the neighborhood to preach and conduct religious services. Father and mother had been members of the German Reformed church. Several years after coming to America, they came in contact with and under the influence of the preaching of Evangelical ministers. It was under the preaching of Rev. I.E. Knerr that they were converted early in 1863. Because of their associations and attendance at the services of these Evangelical people, they were dismissed from the Reformed Church. They then became members of the Evangelical Association and remained faithful members of this church through their lives. Family worship, which consisted of Scripture reading, singing and prayer, was conducted in German. In later years, the singing was discontinued. Mother and father were well versed in the Scriptures. We children were taught by both precept and example. Some precepts mother used to quote when occasion prompted her were: "Zu scharf schneidt nicht", "Besser Unrecht leiden als Unrecht thun"' "Der Klugste gibt nach" and "Die Morgen Stunde had Gold im Munde". Translated they read: "Too sharp does not cut"' "Better suffer wrong than do wrong"' "The wisest yields" and "The morning hour has gold in its mouth". Father was very strict in many respects. This was probably due partly to his military training, which required that things be done punctually and methodically. Mother learned to speak very little English as her contact with English speaking people was very limited. Accordingly, conversation with our parents was in their native language. After mother's death, we children began using more English with father, who, however, never did use the English very fluently. We younger members of the family did not learn the German as well as did the older ones, and English was the means of communication among us. Mother died February, 1890, after and illness of 11 days, at the age of 63 years, one month and 24 days. She suffered much from the effects of a strangulated hernia. Had this been in later years when surgeons and hospitals were available, an operation, no doubt, would have saved her life. Funeral services were held in the home school house, and her body was laid to rest in the cemetery at Roxbury, Kansas. For about 20 years not all the immediate surviving members of the family had been together, but in August 1907, we had the happy privilege of gathering in the old home place where John and his family were then living and talk over things both old and new. Those present were Father, Roxbury, Kansas; Conrad, Harrisburg, Pennsylvania; Adam, Lecompton, Kansas; Lizzie, Holton, Kansas; John A., Roxbury, Kansas; George and I, Hillsdale, Oklahoma; and Ida, Orlando, Oklahoma. 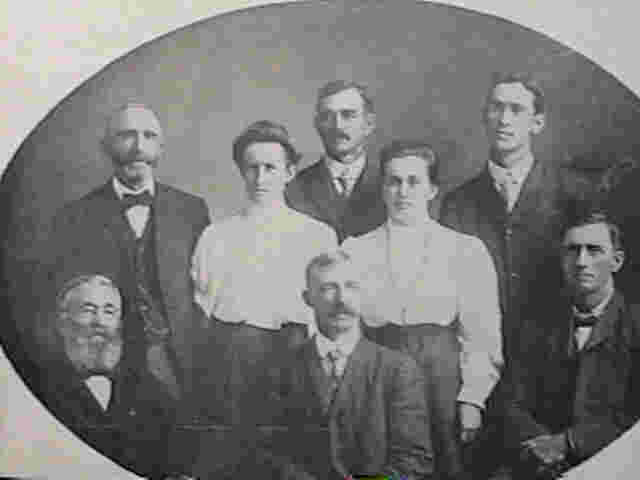 Other descendants and in-laws present were Ira M. and Harold C. Hoffsommer, Harold Erffmeyer, Beulah Hoffsommer, Lela and Hazel Snyder, John's wife, Rose, and her mother, Mrs. M. Manshardt, Mr. and Mrs. Joe Anderson and son, Curtis, and Conrad's youngest son, Walter E. Hoffsommer and his newly wedded wife, who were on their way from Harrisburg, Pennsylvania to Tokyo, Japan, where Walter was to be engaged in religious and educational work. 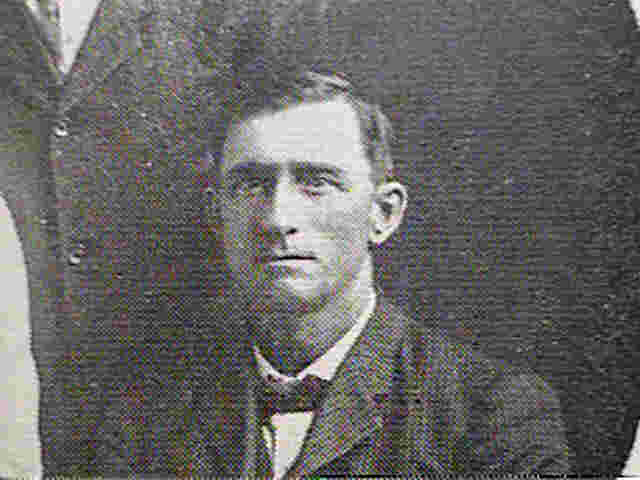 FATHER'S DEATH AND BURIAL Father died August 16, 1911, in Bethel hospital, Newton, Kansas, at the age of 82 years and five months. Funeral services were conducted in the Methodist Church at Roxbury, Kansas, and burial was in the Roxbury cemetery. 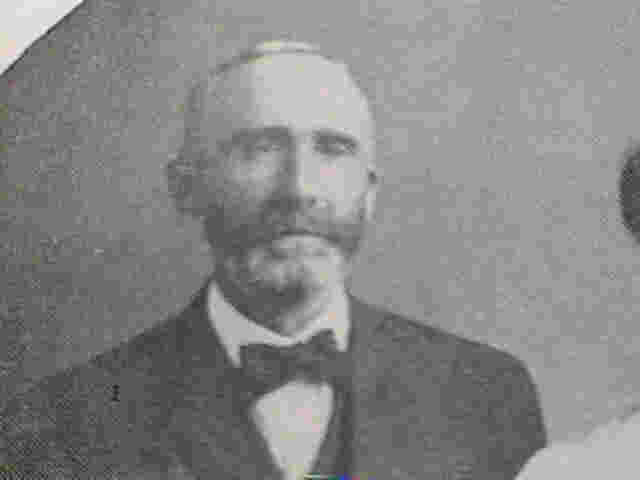 ...son of John and Mary Hermann Hoffsommer, was born in Germany December 7, 1850, and came with his parents to this country on January 3, 1857, and settled at Hazleton, Pennsylvania. Here he attended the public schools and also worked as a slate picker at the anthracite coal mines. Later he engaged in the butcher business with his father. On April 6, 1873, he was married to Mary Melinda Wohlfarth, who was always known as Melinda in the Hoffsommer family circle. Financial conditions following the Panic of 1873, influenced him to seek a new home, and on April 4, 1878, they with their two children and his sister, Mary, left Hazleton for Kansas. They stopped a few days at Sunbury, Pennsylvania to visit Conrad's wife's parents before continuing their journey. After three days and nights they arrived at Newton, Kansas. He purchased a quarter section of land in Battle Hill Township, McPherson County. This land was too sandy for general farming but was good for pasture. Melinda's journal, which she kept throughout most of her life, records at this time: "This is a lovely country and in a few years will be still more so, I think as it is fast settling -- emigration is very great to Kansas now, and still they come." Younger generations of the Hoffsommer family may not be able to realize the inconveniences and privations that Conrad and his family experienced during the few years they spent on that farm. Water had to be carried from the spring or well up the hill to the little "shanty" in which they lived. By the fall of 1879, they had built a new house. Farming did not prove successful for Conrad, so he and father entered the butcher business in Newton, and soon thereafter in February 1882, Conrad's family was moved to Newton. During the time they were in Business in Newton, both he and father suffered from typhoid fever, and Adam helped to carry on for a while after which the business was discontinued. On September 28, 1882, a tornado struck Newton, and the Evangelical church was demolished. At the time a night meeting was in progress in the church, but no one was seriously injured, and only two slightly. In her journal Melinda states that preaching services were in progress when the storm struck. She was near a stove, kneeling she thinks, when the walls came down. Surely it was a miraculous escape for the entire congregation. The family moved to Hazleton, Pennsylvania, in the spring of 1888, and resided in a number of cities during part of which time Conrad was engaged in the retail shoe business. During their later years they lived in Harrisburg, where they were active members of the Steven's Memorial Methodist Church. For a number of years he was custodian of the church building. Five children were born to them: Alfred Franklin, Alice Estelle, Walter Edward, Laura Edith and Mabel Olive. Conrad died August 23, 1918, in Harrisburg. His body was laid to rest at Phoenixville, where they had lived for a while. His wife passed away February 2, 1929, and is buried at Phoenixville. ...daughter of John and Mary Herrmann Hoffsommer, was born in Hazleton, Pennsylvania, January 22, 1858. Her school privileges were those of the public school in Hazleton. With Adam and Lizzie (Anna Elizabeth), she left Hazleton in August 1879, for Kansas, and joined the other members of the family that had gone there in March of the same year. In September 1881, she went to Newton, Kansas to be with her sister, Lizzie. While there she became sick, and a physician was called; but, in spite of all that was done for her relief, she passed away Sunday, September 25, 1881, at the early age of 23. Her body was laid to rest in the cemetery at Newton on Monday. Memorial services were held in the Newton Evangelical Church on Tuesday and were conducted in both English and German. Since early childhood she had been a member of the Evangelical Church. Her death, which was the first in the family of ten children, brought great sorrow to the home. Cassie, the name by which she was usually called, possessed a most beautiful Christian character. Being the oldest girl in the family, much of the care of the younger members of the family devolved on her. In later years Lizzie expressed her belief that Cassie's death was caused by appendicitis. At the time, her trouble was diagnosed as inflammation of the bowels. Cassie had not married. ...son of John and Mary Hermann Hoffsommer, was born September 19, 1859, at Hazleton, Pennsylvania. He attended the Hazleton public schools and also took special instructions in penmanship and became an excellent pnman. When a young man, he learned the butcher business with his father and his brother Conrad. When his parents and other members of the family moved to Kansas in March 1879, he, with Cassie and Lizzie, remained in Hazleton until August of the same year to collect money due father from customers. Not a great amount was collected because of financial conditions created by the Panic of 1873, to which reference has previously been made. A few years after Adam came to Kansas, he assisted father and Conrad in the meat business in Newton for a short time. On February 23, 1888, he was married to Mary E. Manshardt, daughter of Rev. and Mrs. M. Manshardt. The wedding ceremony was performed in the Hoffsommer home. For some time Adam engaged in farming in McPherson county, Kansas and near Randolph, Kansas; and in February 1895, the family moved to a farm in that part of Oklahoma Territory that had been opened to settlement in September 1893. It was here that the then small family experienced some of the privations and hardships in a newly settled country. In March, 1901, they returned to a farm southeast of Topeka where they resided until Adam's retirement when they moved to Highland Park, Topeka. This was in May 1926. From young manhood he was a faithful member of the Evangelical Church, and during his long life he occupied a number of responsible positions in the church he so much loved. He passed from this life to his eternal reward on December 14, 1936. The cause of his death was mio carditis. Funeral services were conducted in the Topeka Evangelical Church, and burial was at Topeka. Children born to this union were Stella Maud Ruth, Mabel Martha, Esther Eleanor, Irene Lydia, Lilly Rose, Raymond Albright, Ruth Mildred and Paul Kendal. (Pictured on lower right of photo) ...daughter of John and Mary Herrman Hoffsommer, was born March 4, 1861, at Hazleton, Pennsylvania, on the day on which Lincoln became president of the United States. She attended the schools of her native city and also took lessons on the organ and became quite proficient on this instrument. With Adam and Cassie, she left Hazleton for Kansas in August 1879, and joined the other members of the family that had gone in March. 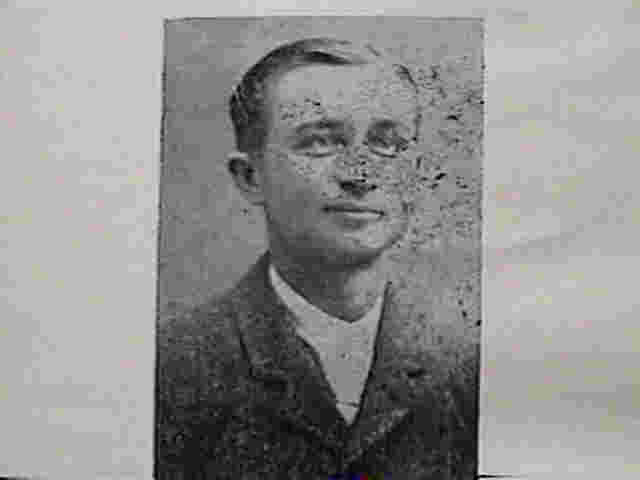 A young Evangelical preacher in the second year of his ministry and stationed at Canada, Kansas, had visited the Hoffsommer families and had preached for them. During his visits, his especial attentions were directed toward Lizzie, and they were married May 13, 1880, in the new home that had been built the previous autumn. This young minister was none other than Rev. Charles F. Erffmeyer, a native of Illinois, who as a young man had attended North Western College (Now North Central College), Naperville, Illinois, where he had completed the German course and much of the Seminary course. As a minister he preached in both English and German with equal fluency and precision. At one time she had a narrow escape from being severely burned. As she and her husband were returning to their home at Newton after having visited her parents, brothers and sisters at Battle Hill, her clothes and wrappings caught fire from a heated brick, which had been placed in the buggy to help keep them warm. The fire in her clothing was extinguished so she suffered no injuries. This happened in late winter of 1881, several miles north of Canton. At another time when she, her husband and their first child Milton, were attending a convention of the Evangelical Church at Newton, a tornado struck the town. This was on the night of September 28, 1882. The church building was wrecked, but none of those attending the meeting was seriously hurt. Being the wife of a minister, Lizzie lived in a number of cities in both Kansas and Missouri, among them being Newton, Atchison, Hiawatha, St. Joseph, Kansas City and Abilene. For 30 years her husband served as pastor, and 20 years as presiding elder (now called district superintendent) and seven years as conference solicitor in the Kansas conference of the Evangelical Church. During these years, Lizzie was a faithful and helpful companion ot her husband and a fine Christian mother to their children. On May 13, 1930, they celebrated their fiftieth wedding anniversary, and on May 13, 1940, their sixtieth at their home in Holton, Kansas, to which place they had moved after his retirement from the active ministry. On June 25, 1940 he passed on to his eternal reward. Funeral services were held in the Holton Evangelical Church, and burial was in the Holton cemetery. Soon after his death, their daughter, Florence, and her husband and their daughter, Faith, came from Nebraska into Lizzie's home and cared for her in her declining years. Lizzie passed from this life on July 23, 1949, at the age of 88 years, four months and 19 days. Funeral services were conducted in the Evangelical United Brethern Church, and burial was in the Holton cemetery beside her husband. Children born to this union were: Milton Garfield, Edna Leona, Erwin Earl, Ira Albright (born January 15, 1887; died February 16, 1887), Florence Elmira, Clarence Escher, Carl Bowman, Samuel Frederick (born February 4, 1901; died in infancy) and Harold Arthur. 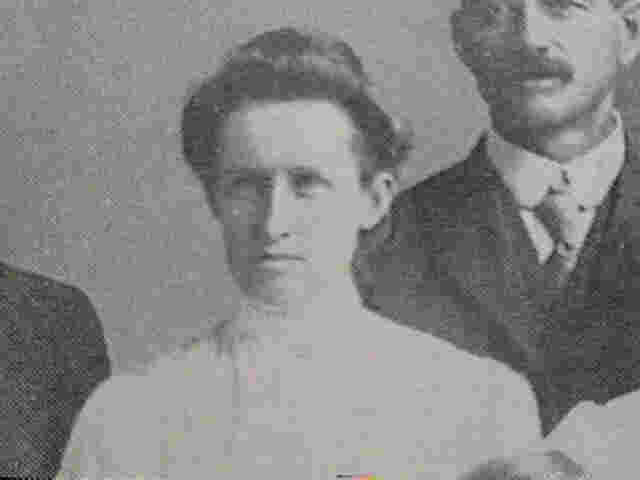 ...daughter of John and Mary Hermann Hoffsommer, was born September 5, 1862, at Hazleton, Pennsylvania. 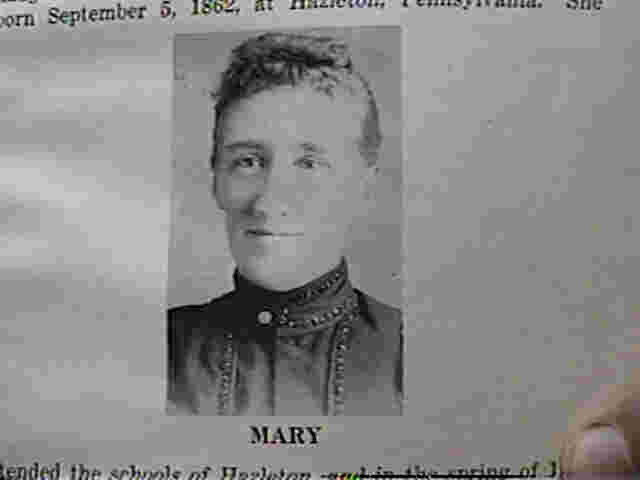 She attended the schools of Hazleton, and in the spring of 1878, she accompanied her brother Conrad, and family to Battle Hill, McPherson county, Kansas. Here she experienced the hardships and inconveniences of frontier life. There was only one family in the whole community with whom she and Conrad's family were acquainted - the Russell family that had some time previously moved from Hazelton. In about a year's time she joined the other members of her family upon their arrival from Pennsylvania. In her early life she became a member of the Evangelical Church. On January 27, 1881, she was married to John H. Wetengel, an acquaintance of her parent's family, who had formerly lived in Pennsylvania. She and her husband immediately began housekeeping on his farm about a mile from her parent's home. She passed away in June 1898. Her body was laid to rest in the cemetery at Canton, Kansas. Children born to this union were: Lillian Amy, Laura May, William, Curtis, Ada and Ethel. ...son of John and Mary Herrman Hoffsommer, was born June 5, 1864, in Hazleton, Pennsylvania. For a number of years he attended the Hazleton schools and later the rural school in Kansas. With his parents and other members of the family, he left Pennsylvania in March 1879, and became a farm boy. Being the oldest boy of the family on the new farm in Kansas at the first, much of the work devolved on him. Before launching out on his own in farming some years later, he hired out to farmers for some time in surrounding communities as well as near home. 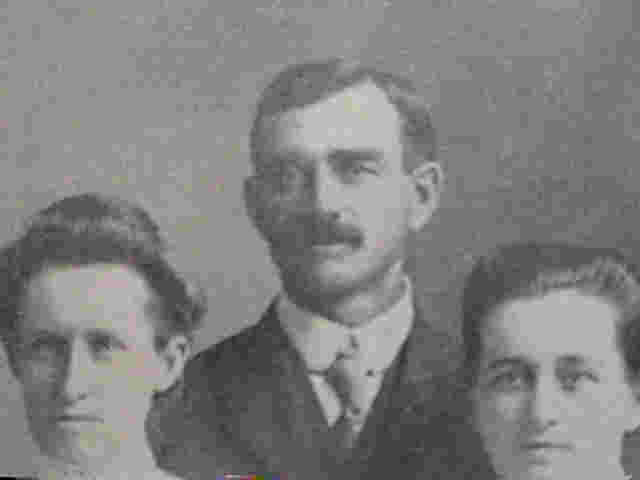 On October 21, 1892, he was married to Rose I. Manshardt at Abilene, Kansas to a sister of Adam's wife. For a while he and George lived on the old home place, and after father's death in August 1911, he bought out the other heirs of the family and continued to reside on the farm until the time of his death. Two sons were born to this union: Ira Manshardt and Harold Charles. John's wife died December 12, 1909. Funeral services were conducted in the Evangelical Church in the community, of which church she was a member. Rev. S.A. Burgert, the pastor, conducted the services, and Rev. C.F. Erffmeyer, John's brother-in-law, preached the sermon. The body was laid to rest in the cemetery at Canton, Kansas. Thus their two sons early in life were deprived of a mother's love and care. John was a regular pal to his boys, both of whom he saw later in life occupy honorable and responsible positions. For years he served as teacher and Sunday school superintendent in the Methodist Church at Roxbury, Kansas, the Evangelical Church as an organization in the community having been discontinued. He also served as member of the school board in his district. While visiting his son, Harold, and family in Baton Rouge, Louisiana, he passed away on February 1, 1940, just 50 years to a day after his mother's death. Funeral services were held in the Methodist Church at Roxbury, and burial was in the Canton cemetery beside his wife. ...son of John and Mary Herrmann Hoffsommer, was born October 8, 1866, in Hazleton, Pennsylvania, where he attended the public schools. Later schooling was in the rural school in Kansas in the home community. In December 1884, he went to Naperville, Illinois, where he entered the preparatory department of Nortwestern College and remained there until the close of the school year. In connection with different studies, he took special work in penmanship and also in ornamental penmanship and became an excellent penman. He taught several terms of rural school in McPherson county, Kansas. He had also taken music lessons and served as organist for Sunday school and church services at the Enterprise school house in the earlier years. Teaching and an indoor life seemed not to agree with Will. He consulted a physician, who provided him with medicine. He took some of it, but, being of an inquisitive turn of mind, he proceeded to test the medicine with reference to alcoholic content; and upon finding tat a burning match ignited it, he declared that it was exactly what he did not want or need, so he discarded it at once. He engaged in farming, and at one time sold 800 bushels of corn for $100.00. Later he farmed with his brother Adam near Randolph, Kansas. Apparently in good health, but thinking it might improve, he went to a sanitarium at Battle Creek, Michigan, for a check-up and treatment. While there he contracted influenza, which was followed by blood poisoning; and his death resulted on February 18, 1892, far away from friends and relatives. Will was a young man of high ideals, and he led an exemplary Christian life. Will never married. Funeral services were held in the home (Enterprise) school house, and the body was laid to rest in the cemetery at Roxbury, Kansas. 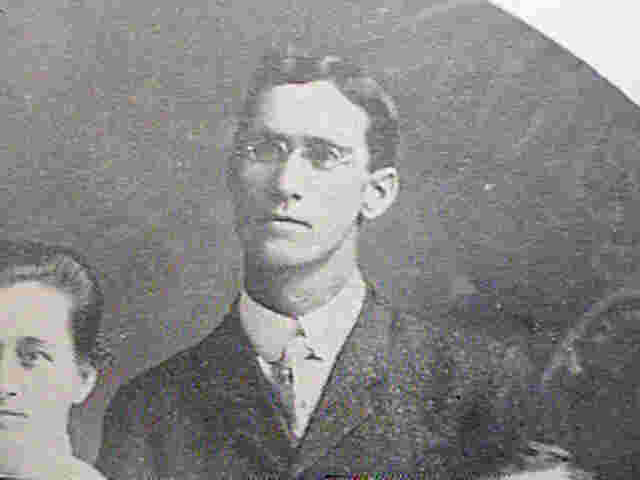 ...son of John and Mary Herrman Hoffsommer, was born April 7, 1869, at Hazleton, Pennsylvania. With his parents and other members of the family, he left his native state and moved to Battle Hill, Kansas, in March 1879. He had attended school in Hazleton, and soon after arriving in Kansas, he attended a spring and summer session of a rural school in the home community. Later the school sessions were in the fall and winter, and tese he attended a number of years. On August 29, 1893, he married Ida D. Johnson, a school mate. They immediately set up housekeeping on the Hoffsommer home farm where they lived until they moved to a farm in Oklahoma in August 1899. This move was made in wagons, one of which was covered with bows and canvas, and it was in this one that his wife and their first born child, Beulah, made the trip, which took about eight days, one of which, a Sunday, was spent in resting. The farm to which they moved, had been purchased the previous year, and it continued to be their home throughout the years. Accompanying them on this trip was the writer, who assisted in the work on the farm a few weeks before returning to Kansas. George served as township assessor in both Kansas and Oklahoma. Both he and his wife were very active in community and church work, both having been Sunday school teachers. He also served as Sunday school superintendent a number of years, following which he still continues teaching a men's class in the Congregational church in Hillsdale of which church they have been members for years. On August 29, 1943, they celebrated their golden wedding anniversary. All their children and grandchildren and other relatives and many friends were present on this happy occasion. Children born to this union were: Beulah Rosmond, Harley Edward, Helen Marguerite, Leroy Herman and Marion Siver. George's wife passed away peacefully in her home church on September 13, 1945, immediately after she had taken part in a women's missionary meeting. Funeral services were held in the Hillsdale Congregational Church. Her brother-in-law, Rev. B. Warden Young, preached the sermon. Burial was in the Memorial Park cemetery north of Enid, Oklahoma. ...son of John and Mary Herrman Hoffsommer, was born June 28, 1872, in Hazleton, Pennsylvania. With his parents and other members of the family, he moved to Battle Hill, Kansas in March 1879. He had attended school in Hazleton, and, upon arriving in his new home, he continued his first year of schooling in a rural school. Throughout his entire rural school career, the terms were very short, thus necessitating more than the usual eight years, required to complete the common branches. Over a year after he received his common school diploma, he entered the academic department of Bethany College, Lindsborg, Kansas, where he remained until the close of that year. He then taught a five months' rural school for which he received $32.50 per month. He again attended school at Lindsborg part of a school year and later took work in the academic department of McPherson College, McPherson, Kansas, and continued teaching and attending county normal institutes for teachers at McPherson and later at Enid, Oklahoma. In the spring of 1900, he received the appointment as federal census taker for Battle Hill township, McPherson county, Kansas. For contacting the heads of all families in the township and gathering all required statistics, he received the sum of $29.77. It was in June 1901, that he came to Oklahoma, where for a number of years, he worked for his brother George during the wheat harvest season. After attending several summer sessions at the Normal School, Alva, Oklahoma and one year's attendance, he received a life diploma to teach in Oklahoma. Aside from residential college work, he also received college credit for correspondence courses taken from different colleges. Later he received the degree A. B. from Phillips University, Enid, Oklahoma. During three short summer sessions, he took post graduate work at the University of Colorado. His teaching experience included a number of rural schools, superintendent and teacher in town schools, one summer session at Phillips University, and two summer terms at Northwestern State College, Alva. He also served as superintendent of public instruction of Garfield county, Oklahoma, from September 1918 until July 1925, having first been appointed to fill an unexpired term and then elected for three successive terms of two years each. On August 4, 1913, he was married to Elsie May Brooking, a teacher, whom he had met two years before in the president's office at Northwestern State Normal, Alva, when both were students in the school. 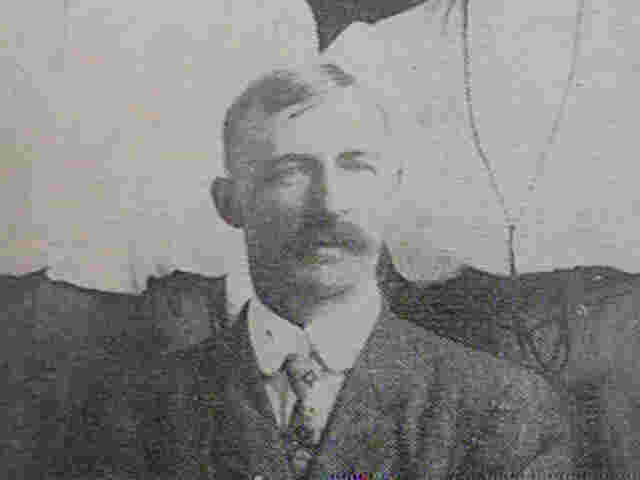 After completing his work as county superintendent of schools at Enid, the family moved to Jefferson, Oklahoma, where he was superintendent of the Jefferson consolidated school for seven years. In a few years after moving to Jefferson, Mrs. Hoffsommer resumed her work as a teacher and continued as a primary teacher in the Jefferson school for 22 years, retiring from teaching in the spring of 1950. She has a B.S. degree from Northwestern State College, Alva, and is a member of the Delta Kappa Gamma, a national honorary teachers' organization. Because the republican candidate for the state legislature from Grant county in 1940, withdrew, Charles consented to have his name placed on the ticket. He was elected for four successive terms with increasing majorities each year until the last when he had no opposition. He was a member of the House of Representatives during the sessions of 1941, 1943, 1945, and 1947 and during the special session of 1944. He was not a candidate for reelection in 1948. They had both been active members of the Methodist Church, but on their return to Enid in August 1950, they placed their church membership in the Evangelical United Brethern Church. Two children were born to them: Paul Ray, November 17, 1917; died November 18, 1917; and Edna Marie. ...daughter of John and Mary Herrmann Hoffsommer, was born February 12, 1874, in Hazleton, Pennsylvania. With her parents and other members of the family, she moved to Battle Hill, Kansas in 1879. Her formal education privileges were those of the district school. On December 8, 1896, she was married to Martin Snyder, a farmer, whose home was a few miles from the present site of Lucien, Oklahoma. By a former marriage he had two children, Ernest and Berniece, who had lost their mother by death, so Ida became a mother to them. That part of Oklahoma Territory in which they lived was known as the Cherokee Strip, which had been opened for white settlement a few years previously. Accordingly, her lot was to experience frontier life and be denied many opportunities and conveniences, but through all these conditions she was a wonderful mother to her children and set them a fine Christian example. Ida passed away January 10, 1931. Funeral services were conducted by Rev. Hinley, pastor of the Lucien Methodist Church, of which she was a member, and her body was laid to rest in the Lawnview cemetery near Lucien. Her husband had preceded her in death April 30, 1919. Children born to this union: Lester Raymond, Dewetta Manila, Hurley Clifford, Lela Grace, Hazel Margaret, William Bryan, Albert Roy, Clara Pearl, Clarence Earl and Elsie Lorene. Note: the remainder of the text as originally published by J. Charles Hoffsommer went on to identify the known descendants of the 7 lines down through 1951. In the interest of privacy on the internet, I have deleted the remainder from this file. The 1993 Revision I published includes the entire text plus an extensive update of the descendants. If you are a family member and wish to obtain the entire volume it is available.